Taylor Bowen, Natalie Cole, Katie Pfaff and Anna Rather are all Butler students who have been selected to be 500 Festival Princesses. Photo courtesy of 500 Festival Inc.
Four Butler students are redefining what it means to be a princess. Taylor Bowen, Natalie Cole, Katie Pfaff and Anna Rather have been selected as 500 Festival Princesses for the 2018 Indy 500. The 500 Festival is one of the largest festivals in the nation. It produces events and programs from February to May centered around Hoosier pride and the spirit and legacy of the Indy 500. It aims to have a positive impact not only on the city of Indianapolis but the entire state of Indiana. 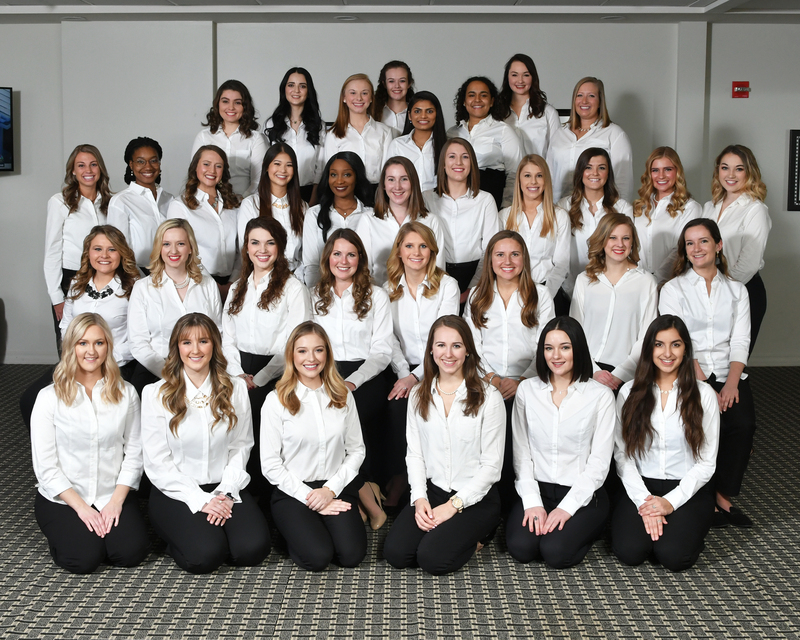 The 500 Festival Princess Program, in particular, recognizes 33 Hoosier women­ – the same number of drivers as in the Indy 500 – for their academic, civic, professional and personal ambitions and accomplishments. This year, the 33 women selected represent 14 universities and colleges and 21 cities and towns all within the state of Indiana. Commonly misinterpreted as a pageant, the Princess Program is a scholarship program intended to provide college women with the resources and opportunities essential to success. Natalie Cole is a 2018 Festival 500 Princess. Photo courtesy of Festival 500 Inc.
Natalie Cole, a junior violin performance major with emphases in music theory and music history, spoke out against this misinterpretation of the program, emphasizing the scholarship’s attention to women empowerment. To be selected as a 500 Festival Princess, applicants answered a series of essay questions regarding Hoosier pride, community awareness, civic engagement and what their community means to them. Resumes and grades were submitted as well. Next, applicants went through a series of first-round interviews with festival board members, community leaders and former princesses. The hundreds of applicants were then narrowed down to 66 women for a second round of interviews. Thirty-three were selected as 500 Festival Princesses. Katie Pfaff is a Festival 500 Princess. Photo courtesy of Festival 500 Inc.
Katie Pfaff, a junior majoring in strategic communication as well as human communication and organizational leadership, described the application process as one similar to applying for a job, no pageantry included. Acknowledging that the common misconceptions and stereotypes surrounding the program are a product of the “princess” title, all four of Butler’s 500 Festival Princesses spoke in defense of what this title truly means. Anna Rather is a 2018 Festival 500 Princess. Photo courtesy of Festival 500 Inc.
Anna Rather, a junior English major, emphasized that there is more to a 500 Festival Princess than what the princess stereotype portrays. Cole attributed a large part of this striking down of the stereotype to the diversity and uniqueness of her fellow 500 Festival Princess class. Taylor Bowen is a 2018 Festival 500 Princess. Photo courtesy of Festival 500 Inc.
Taylor Bowen, a senior digital media production and art + design double major, said this dedication to diversity in the princess class is her favorite part of the program. Bowen explained a diverse class is especially crucial to the outreach events planned by the princesses themselves. “You can really take what you’re passionate about and merge it with the festival,” Bowen said. Bowen is working to plan two events: an event at the Indiana School for the Deaf and a Paint with a Princess event at Newfields that teaches kids about painting and art history. Having lived in Indiana her whole life, Pfaff described how her experience in this princess role has deepened an already formidable love and appreciation of the Hoosier state. All four of our princesses agreed that this experience will impact their lives past this year’s 500 Festival season. They spoke prominently of the professional development and networking opportunities allotted them as a result of the program. These professionals in the Indianapolis community work with the 500 Festival Princesses, offering them advice and guidance through seminars and one-on-one interaction. Each Princess receives one of these community leaders as a mentor based on shared interests and passions. Through a lunch with her mentor, the 500 Festival CEO Bob Bryant, and his wife, Rather realized that the Princess Program would affect her personal life as well as her professional one. To support the princesses in their endeavors, the 500 Festival awards a scholarship of $1,000 to each princess. Among the 33 selected, one princess will be further distinguished as the Queen Scholar, receiving an additional $1,500. Princesses will volunteer at all 500 Festival events throughout May and present at several Indianapolis Motor Speedway functions. They will also participate in pre-race ceremonies, taking the first lap in pace cars with their mentors, as well as the Victory Circle celebration at the race. Bowen encouraged all Butler Bulldogs, crown or no crown, to get involved in the 500 Festival, pointing out the April 11 registration deadline for invitations to the Festival’s Volunteer Appreciation Day on May 19. As May nears, Bowen, Cole, Pfaff and Rather will be increasingly involved with the Indianapolis community as 500 Festival events rev up. Keep an eye out Bulldogs, there’s royalty among us and they’re coming in hot.